Cabinet sized [1-3/4x 3-3/4x 2-1/8"], this Arkansas golden healer quartz cluster is possessed of TWO right-handed points - and more rare, thus, at 8 and 9 faces each. 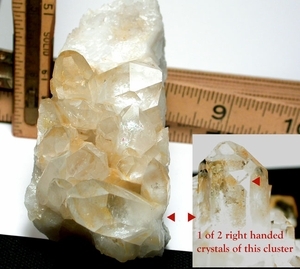 Half densely intergrown clear golden crystals and half milky quartz in regrowth over a milk and sandstone matrix, several crystals have an uncommon 7h face. We note rainbows, attractive white titanium 'blooms', and factored a 1/8" bruise to the 9h faced crystal in. Record keepers. Collier Creek Mine, Montgomery County.